Last month, I shamefully dropped the ball on my mother's birthday. My reason, though far from an exculpatory one, was that I was in the middle of my first Wedding-Related Meltdown. I spent her birthday weekend at my parents', but the only present I was able to manage was to promise to try on any wedding dress she wanted, no complaints or questions asked, for the whole day. While she seemed genuinely thrilled at the prospect, it was hardly worthy of her birthday! 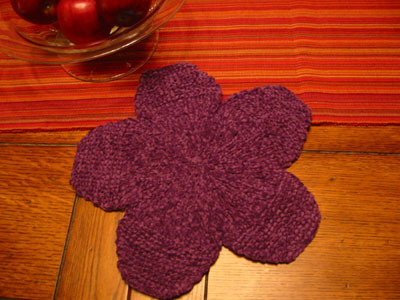 So when I came back to Boston, I knit her up a quick washcloth from Weekend Knitting. It's a bit belated, but I think she'll like it.